A curiously dated child’s suitcase arrives, unannounced and unexplained, in a modern-day Washington suburb. A week later, American genealogist Jefferson Tayte is sitting in an English hotel room, staring at the wrong end of a loaded gun. In his latest journey into the past, Tayte lands in wartime Leicestershire, England. The genealogist had hoped simply to reunite his client with the birth mother she had never met, having no idea she had been adopted. Instead, he uncovers the tale of a young girl and an American serviceman from the US 82nd Airborne, and a stolen wartime love affair that went tragically wrong. 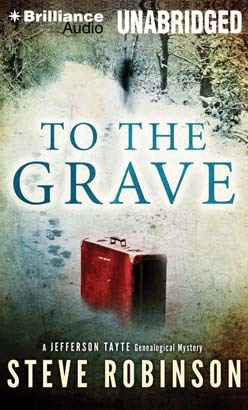 With To the Grave, Steve Robinson confirms his status as a master of the taut and delicately constructed historical thriller. This is the second audiobook in the Jefferson Tayte mystery series, which begins with In the Blood, but can be enjoyed as a stand-alone novel.